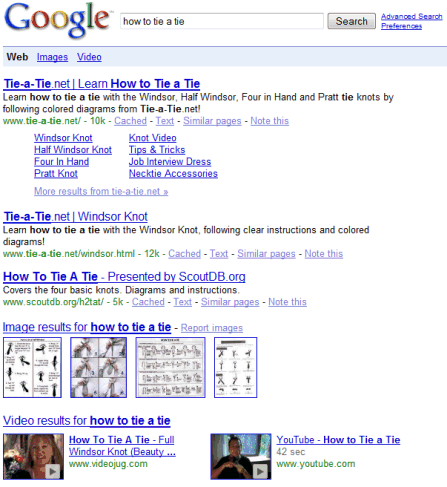 Google adjusted the interface for video results that are part of universal search. Until now, Google promoted two videos in the first 10 results if the query was strongly associated with videos, but they looked like standard results. The new interface separates the two results from Google Video and this is more in line with other types of OneBoxes (images, local business, news) that evolved into universal search results. Another change is that the image results group has 4 images instead of only 3 and it can be displayed inside the list of search results, not just at the top or at the bottom. When the image results group shows up at the top of the page, the thumbnails are significantly larger. Building an universal search engine that manages to rank web pages, images, videos, books, maps turned out to be a difficult task, so Google tries to do something easier: rank OneBoxes for different specialized search engines and display them in appropriate places. You can find a version of Google that doesn't include universal search results at searchmash.com. As you can see, just when you think they've changed the rules... in reality, all they did was introduce a new rule. The more likely scenario is that Google doesn't just determine search types that should or shouldn't have a video. They likely have a scale system. Perhaps VERY LIKELY, SOMEWHAT LIKELY, and UNLIKELY. With one prominently displaying video results as high up as the #1 spot, and even multiple results to boot... another using a specifically places OneBox... and the latter not showing any video results at all. Google adjusted the interface for video results that are part of universal search. Until now, Google promoted two videos in the first 10 results if the query was strongly associated with videos, but they looked like standard results. The new interface separates the two results from Google Video and places them in a fixed position, before the fourth organic result. Please let me know when & how google consider video results in its universal search? I would like to have Amharic, the official Ethiopian language, included in the Google translation system. I suggest to remove the Greek language and insert the Macedonian , because the entire so-called Greece is Makedonija.Thanks! it is necessary to enter the Macedonian language, because half of Macedonia is in the United States, Australia, Canada and many other countries around the world.Magotity of them use this services.If this service is because of practical resons, please enter the Macedonian language.